Beauty, and What It Means: To Shampoo or Not Shampoo? Girl, I wash/bleach/color/blow dry/ my hair all the time and other hairdresser friends are mad at how shiny and healthy it is. My strands are just indestructible. And you too, are just blessed with good hair! Shampooing it every once in awhile is not going to damage or kill it, you're fine. If you feel gross, wash it. Principles shmipnicples, if you feel self conscious about the grease or you miss the feeling of shampooing it, do it! I think it might be fun for you to wash it, specifically because it has been this long. Maybe you would get into a thing of washing it ever few months, and you would love the joy of doing it just that often. My sister-in-law has been a pro hair stylist for 19 years, and she always does a fantastic job on my hair. The reason I bring her up is because she doesn't wash her hair, either. She gets it wet and conditions it daily, and her hair ALWAYS looks fabulous! She told me if I wanted to wash my hair, I should only do it once a week. So maybe you could compromise (gasp!) and wash it once a week, or less, or whenever you really feel like it needs washing. But Ali, then I wouldn't be a true HAIR WARRIOR. I'd be, like, a hair diplomat. A hair ambassador. My god, a hair mediator! That aside, I like the idea of that--I feel like my scalp has really slowed down on the oil production, so I really wouldn't have to wash it every day like I used to. Thanks for passing on her tip! Hmm. I'm admiring your bedhead...and wondering if I ought to try this. What's the deal on baking soda/vinegar? Which makes not washing it totally a non-issue, I love it!! It's really low maintenance. He actually has hair as long as yours, but he doesn't wash it either, except with water. I think that it works for him because he shaved it all off and then didn't wash it while it was growing back so now it is super healthy and natural. But I can understand that you possibly or probably don't want to cut it short at the moment. I think you should definitely start with the hippy solution, and if that doesn't work for you... well I think you'd still be a hair warrior if you shampooed sometimes!! Also, I like the smell of hair! But then, I have also given up body wash recently and don't care about not smelling like all those lovely, floral, ah, chemicals. Cervixosaurus, I LOVED having a pixie cut. In fact, if I cut it again it'll be to that (or a shaggy bob). I had long hair until I was 24 and cut it off in a rage, and found that I loved having short hair. The long hair was an accident, sort of--I lost my job and quit getting haircuts and just wore my hair up all the time, and suddenly I had long hair, ha! About 12 years ago after having major surgery I started shedding huge amounts of hair and what hair remained seemed to lose its elasticity and shine. A friend suggested I try a shampoo bar which I did, but I didn't like it. I finally ended up making my own and loaded it with infused Marshmallow Root, Chickweed, Nettle Leaf, Horsetail and Chamomile. I also found that rinsing with an herbal vinegar rinse infused with these same herbs combined with the shampoo bar gave me back the kind of healthy hair I had in my teens; thick, shiny and full of bounce. Even my husband of 41 years tells me this. Autumn, when or if you decide to try the all natural way to healthy hair send me an email and I will send you a shampoo bar and Herbal Vinegar rinse to attempt to convert you. Hi BJ--thanks for reading! You know, I am indeed thinking that if I go back to shampooing, that I'll seek out natural options. I was thinking of doing baking soda apple cider vinegar, but would be happy to give a shampoo bar and herbal rinse a try--it sounds like a much more pleasant, ladylike version of plain old cider vinegar! I will alert you when it's time to wash my hair again--looking forward to it already! I tired this about a month ago now. I use baking soda, and apple cider vinegar. My hair is shorter that yours, I use an oz. of vinegar, and a couple tsp. of baking soda. But it FRIED my hair the first time, so I made it into a paste, and that worked really well. The paste ensures that the baking soda doesn't get on your ends and dry them too much. I heard baking soda is very drying on the scalp and strips the oils in your hair. Same with vinegar. I want to try this with no washing at all but I'm afraid of how bad my greasy hair will get! your hair looks great I hope you didn't go back to shampoo! Try bicarbonate of soda (1 tablespoon in 1 cup of water, mix well) as shampoo and white vinegar or apple cider vinegar (about the same dilution). The dilution is key to stop it drying out. Leave the bicarb mix on for about 1 minute and rub into scalp, then rinse out thoroughly. 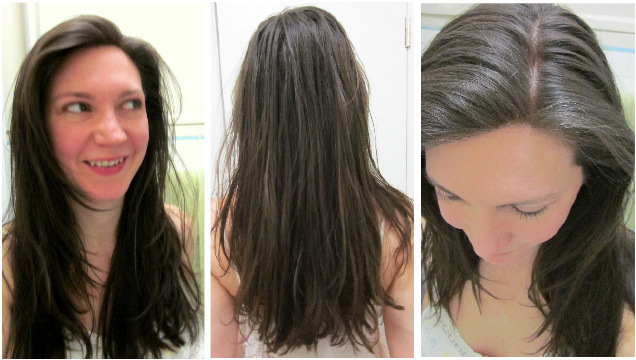 Then use the vinegar mix on the ends of your hair for 1 minute. The key to stop it drying out/becoming greasy is to rinse thoroughly. Are you still not using shampoo? Quote by a hairstylist from Christa d'Souza's story: "I have had many people in my chair who haven’t washed their hair in ages, and the bottom line is, it smells." Do you agree with this? Does "no-poo" hair truly stink? Is it something that simply smells bad to some people? Vinegar kills oder causing bacteria. For the hair dilute it because using full strength will cause your scalp to itch. White vinegar is stronger than Apple vinegar. Both do a good job. Use it when your hair starts to stink. Back to hair. Why no mention of washing your hair with honey? The goal is to remove the excess oil without stripping it all off like traditional shampoos do (which makes your scalp produce more oil). Water and oil don't mix. What you want to do is add an ingredient that bonds to oil and water, like honey. Add honey-poo to you hair, rub it in, then rince. Use a hair dying bottle. and mix 1 part honey 3 parts water. The honey can be pasteurized. I buy the cheapest I han find and eat the good stuff. Those that say it has to be unpasteurized are just speaking from there pie hole. and the same goes for apple cider vinegar. I will mention it again, eat the good stuff and use pasteurized on you body. First thing you do when you get in the shower is rince your fair then add the Honey-poo. rince at the end of your shower. If you hair stinks, use the vinegar first for one minute then rince well. proceed with the Honey-poo. IT will remove the possible vinegar sell your hair might have. You may bring a person's clothing travelling bag to a source which provides embroidery louis vuitton replica sale. Check with the vendor to use a person's term or perhaps attractive style and design stitched in the finish within your facial travelling bag. And also you can use them yourself at your house when you are confident with a person's embroidery ability. When your facial travelling bag is made from vinyl, you may lure plus publish a person's style and design from a long-lasting marker. Additionally you can apply a person's plan and after that stuff it to a person's style and design. You might also sequence your customized fake louis vuitton outlet out of a strong internet source that is certainly dedicated monogramming. And after that make sure you copy a person's snapshot with the associates to your internet source, keep these things decide to put a snapshot on your makeup products travelling bag. Complement a form of a dyed bows to a ribbon. You may publish a person's term utilizing long-lasting marker on one with loops of your ribbon in order that it is often without difficulty observable. And after that to attach a fake louis vuitton sale to the facial ribbon, you can utilize an weapon glue in order that it is often included upon it and already you will have a attractive facial travelling bag. Fake getting to sleep baggage and also all-natural getting to sleep baggage, fake and also all-natural, what design must get? Does indeed the following concern fake chanel bags parenting it has the awful travel on your mind? To not ever stress. There are certain choices for all-natural getting to sleep baggage: your constructed from wool getting to sleep travelling bag, your egyptian cotton getting to sleep travelling bag plus all the way down filled up getting to sleep baggage. Other preference to bear in mind is definitely fake getting to sleep fake chanel bags. Each of them includes quite a few good and bad points.